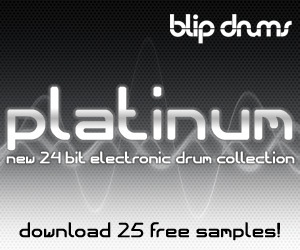 Blip Drums has announced the release of their latest electronic drum sample collection called Platinum. One year in the making, Blip Drums says their new 24bit Platinum collection is “a stunning array of 1000 electronic percussion hits designed from their own hand made analog circuits”. Blip Drums says their sole purpose is to supply musicians and DJs of all genres with affordable, yet expertly crafted electronic drum samples. Their new Platinum collection is an all new assortment pounding eccentric bass drums, crisp textural snares, pulse driven hats, future funked toms, and more. 192 Open and Closed Hats.